After the strains of bootcamp and my long run over the weekend, my legs were in need of rest and a massage yesterday. Jack has done sterling work in loosening the muscles ready for tonight's club run. It's the final week of this particular route but my first club run in my new trainers and first ever run with my new run light. 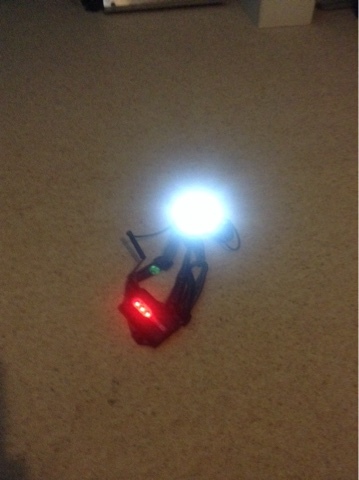 It has a chest mounted white LED which is pretty bright and a flashing red LED on the battery pack which is on my back. I'm hoping it's more comfortable than the miner's style light I used last week, it's certainly brighter. Whilst most of tonight's route is reasonably well lit, I'm very aware of the cracks in the pavement and trying to avoid injuring my foot again, hopefully this will help.